Understanding what kind of target to purchase when you’re just starting out with archery can be flat out exhausting since there are so many models on the market that comes in various shapes, sizes, and are suitable for a range of different arrows. How are you supposed to practice your shooting if you don’t know which practice target to purchase? We looked at the Rinehart Targets 18-1 Broadhead Target to give you the essential things you need to know so that you can decide if you want to buy it or not. Keep reading to get the low down on the target. Archers of all experience levels could use the Rinehart 18-1 target efficiently, though because of its size, it is recommended that more advanced archers use the mark. Once you’ve built up enough shooting experience and have honed your eye, moving to a smaller target such as the Rinehart 18-1 wouldn’t pose an issue for you, so as a beginner archer, you might do better with a larger target that leaves more room for error. The benefit of purchasing a foam target is that it doesn’t come in multiple pieces that you need to assemble. Rinehart made this target using a “self-healing” foam material. In addition to the 15’’ x 15’’ x 15”, 14-pound target with included carrying handle, you’ll also receive an owner’s manual, and warranty information. The Rinehart 18-1 Broadhead Target is known to be one of the longest lasting, easy-arrow removal targets that are available on the market. It has an impressive 18 target zones spread across all sides, making sure it’s always ready for an arrow. The target itself is made from Rinehart’s trademarked and legendary foam that can absorb broadheads, target points, and even expandable arrows without losing any of its shape. On the off chance that you do shoot out a section, you can rotate the target for a new zone and fresh foam. Additionally, the target is resistant to the sun, moisture, hostile temperatures, and is weatherproof. It’s also lightweight, and the carrying handle makes it easy to move it around. Rinehart backs their target with a year guarantee that other manufacturers don’t place on their shooting targets. If you shoot out all 18 sides of the sturdy and durable target, the company is open to replacing it without a hassle. Without a doubt, the best way to get the most out of the Rinehart 18-1 Broadhead Target is to follow the guidelines that are provided in the owner’s manual. The target is designed to take broadheads, target points, and expandables, so using anything else could cause the foam on the target to wear out quicker, and cause the foam to rip when extracting the arrows from the target itself. Depending on the number of arrows that you shoot into the target, it should last you for more than a few seasons. There are videos on YouTube that show the Rinehart 18-1 still holding together after taking over 8000 arrows. We’ve included a YouTube video review, so you can get a look at a few different arrows shooting into the target, and how the foam reacts when they get extracted. In the video, the mark has taken approximately 1000 arrows. 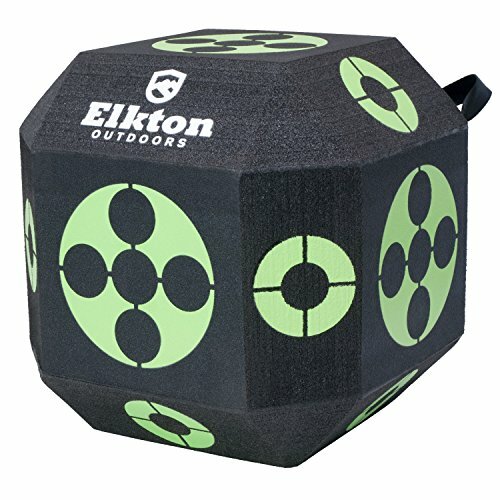 When looking around to find a comparable target, we were able to find the Elkton Outdoors 6-Sided, 18 Zone 3D Cube Archery Target. It has a lot of the same similarities as the Rinehart 18-1, including the self-healing foam that makes the Rinehart so popular. Though, the Elkton target is slightly larger in size, which makes it more convenient for the less experienced shooter, or for archers looking to shoot from a distance. Overall, Rinehart makes impressive targets that indeed appear to last a long time. During our research, we found some that continued through 8000 arrows, 5000 arrows, and more. You do pay slightly more for Rinehart targets, but given their long life and the warranty that the company provides, the cost becomes more than worth it. While we do wish that the target was bigger, the versatility, portability, and durability of it quickly made up for that con. Despite the reports of arrows being challenging to extract, we found that there wasn’t any issue, so long as the right arrows were used. As a more experienced archer, you might thoroughly enjoy this target from a distance because it’s on the smaller side and requires precision with your practice shooting. If you are new to archery, the target works great if you are at a close distance, but once you get further back, your chances of missing are high unless you’re a consistent shooter with a low missed rate. We recommend purchasing the Rinehart 18-1 Broadhead Target for practice purposes. 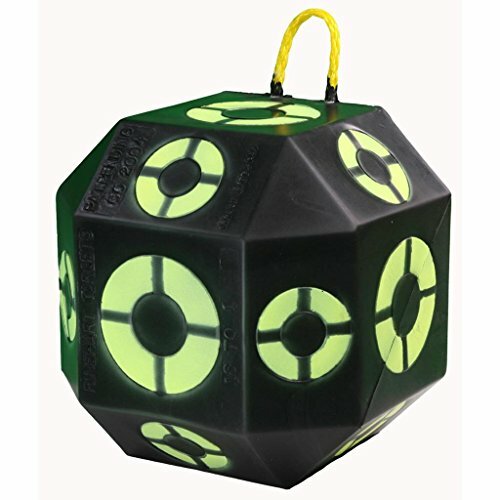 It’s portable, easy to carry, has a durable handle, and works well with a variety of arrows. Just remember to put it in a safe place while you’re shooting. Wow, Targets have certainly come a long way. I remember my first target practice at home was made from rolling 6″ strips of cardboard together until it was the desired size. Then once you shot out the center you had to extract the center and replace it with another roll of cardboard. Obviously it was more difficult to do than what it seemed like it would be. I love the fact that this is a self healing target. Even considering the price. Hi Debra, yes targets have come a long way, some people still make their own these days which is great, but it can be a hassle especially if you are spending half you day repairing it. For those who don’t have the patience putting it all together, the Rinehart is a great choice for target practice. The Rinehart 18-1 target is built for long lasting which makes the price really reasonable, Rinehart Target even guarantees the 18-1 for full year and if you shoot out all 18 sides within the year, simply visit your authorized Rinehart dealer and they will be happy to replace it hassle free! What makes it so great is that It has a self-healing foam, that can take an arrow(s) abuse one after another. Enjoy the Rinehart right in your backyard, making it quick and easy for practice for either hunting season or simply target practice, it’s easy to carry as it has a handle to take with you on the go. I’ve been looking for something like this for ages. I’m also really short and have been strugggling to find something suitable for my height for years now. I found your website and I’m so glad I did. Thanks for the review of the Rinehart 18 as it even comes in my favorite colour! How did you come across it originally? That’s pretty cool and looks like a must-have item for all who practice archery! So, once you shoot at it, when you take out the arrow, it heals itself up as in it closes where the hole was made? Do you know of anyone that has used this item and actually managed to shootout all 18 sides within a full year? That sounds intense!